If you get 4 year out of your laptop thats great. you'll probably want to upgrade by then anyway. Good luck never hurts . Exactly. I was planning on replacing it late this year/early next year anyway. Well - it runs now - sort of. I forgot to bring my gps receiver home with me, so I can't do a whole lot with it. Seems like not having a receiver attached causes it to crash. I might run to the truck tomorrow and grab it to see if that's the problem with it. As far as the program, it did indeed get a whole re-write. The screens are bigger and they made everything with "left-clicks" and there is no "right-click" functionality now. The maps are updated, but with any GPS, if I look hard enough I can find roads that are mislabeled or missing. The POI's are working fine also. The truck routing feature appears to be improved and works well as long as you create yourself a custom profile in the program and identify which roads you want to "favor" and "avoid." If you don't make sure to turn on "53-foot and National Network" routing and then choose which types of roads that you want to "favor and avoid" then it won't keep you away from low bridges and small streets, etc. As far as bugs that I have found so far, the only big one is that it doesn't run at 1440 X 900 resolution. Setting your screen to anything lower than that makes it work fine. They report that the patch is already underway for this bug. They sent me the email yesterday suggesting the screen resolution change and it works now. The highest setting I could find that works on my laptop is 1024x768 which is fine except that my laptop is a widescreen and now everything is stretched out. I'll give it a try today while I'm running. I see that the traffic feature is a "pay to play" item. I thought it would be used if you have an internet connection. I just wish I could use my custom POI's in it that I've already saved from version 9. Screen resolution: So far I haven't seen any resolution bug other than at 1400. Many laptops don't even go that high. I am running it at 1280 X 900 and it looks great at that setting. Try that setting if yor laptop has it when you get a chance. This will be fixed in the first patch. Traffic: IS NOT pay-to-play. You go to the Menu / Settings page 2 / Licensing / Traffic (GPRS) and enter an unlock code that ALK gives you for free by calling in (unfortunately there is an extra call to them involved.) Once you turn that on and you have a web connection (like an air-card) in your truck, then it works really slick. It shows you upcoming traffic problems in the city areas and allows you to "avoid" or "ignore." If you choose to "avoid" then it routes you around using the route preferences that you have set up in your "profile." Custom POI's: Yes they did NOT put a POI "manager" inside the program yet and that is a major inconvenience in my opinion. YES, it is on the developer list to be patched because of all of the complaints, so keep your eye out for that fix. YES, there is a back door to manually transfer all of your previous custom POI's but I would not recommend it to anyone that is NOT computer savvy. If you know your way around the windows directory folders then it can be done. Maps: Are updated through winter of 2007 using the PCMiler database, so that is a big improvement too. Hope that helps you man. Alright - I've ran the new CoPilot for the past 24hrs or so. It's definitely different than version 9. I love the new display. The colors are much better and it just looks a lot better overall. I really haven't been to a lot of locations yet, but I did notice that it's picked up on some roads that weren't in version 9, so that's a big plus. POIs - One major thing I don't like about the new setup is that the truck specific POIs aren't in categories like v9 (Cat scales, truck washes, etc). Now there's only one category - Truck Services. 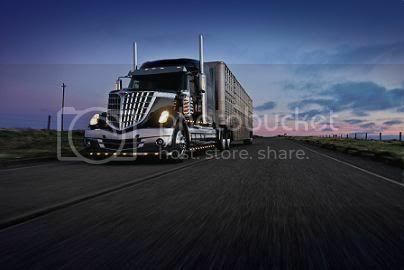 Truck Services is anything from parking in a mall parking lot to a full truck stop location. It's up to you to guess what it means. When I talked to ALK yesterday they said that's another issue that they're wanting to have resolved in a future patch. How do you copy the current custom POIs from v9 to v11? I know my way around the computer. Traffic - I found out about the traffic activation yesterday as well. I activated it and so far love it. It warned me of road construction and wrecks this morning coming through Buffalo, NY. Very nice feature. Other than the issues I've listed before (the custom POIs, Save Current and the screen resolution) I'm impressed with the new CoPilot. I agree that the new display is visually nicer and clearer. I continue also to try addresses that were missing from CPT 9 and they are actually in version 11 so that has been a major plus for it. The traffic feature is a super-cool addition as you say. The POI sub-categories are actually still in CPT11 also - they're just not under "Menu / Settings / POI's." AND I agree that they should be put back there. You can still see them by going to "Menu / Plan or Edit Trip / Add (the plus sign or use New Trip) / POI. If you select "Pick Category" in this screen you will see a button at the bottom light up in many of the categories which will allow you to view the sub-categories like in Ver 9. For instance, the "Truck Services" category breaks down into: Truck Stops, CAT Scales, Weigh Stations, and Highway Exits. The "Save Current" is also still in 11. It just saves it as a "Favorite" instead of as a Custom POI now. In "Driving Mode" you just click "Menu / Save Current Location." Please EMAIL me using the link under this post and I will reply with my "importing custom POI's work-around procedure." The Favorites are limited to 25 entries, isn't it? Very cool about the sub-categories. I didn't even notice that before. I emailed you for the POI importing info. I just ran the POI conversion and it FREAKIN ROCKS!!! Perfect instructions. Now I'm about 98% happy with CoPilot 11.